Prior to joining Norman Osborn's cabal, The Hood (aka Parker Robbins) was consolidating power amongst the super-villain community, making himself the new kingpin of crime in New York City. Soon after Norman's Dark Reign began, The Hood sent the villain White Dragon to Mr. Negative (aka Martin Li) to request that Mr. Negative pay the 'tax' he owes The Hood for the criminal enterprises he ran out of Chinatown. When Mr. Negative refused, The Hood set up a blockade around Chinatown using Osborn's H.A.M.M.E.R. forces. The Hood also unleashed various super villains to wreak havoc throughout Chinatown. In response to these aggressive moves, Li sent his agent Hammerhead to deliver a message to Norman Osborn. The message was brief, call off the H.A.M.M.E.R. forces or else. Norman, of course, refused. Mr. Negative resorted to plan B, black mail. He presented incriminating documents to Osborn, revealing the director's involvement with experimentation on Chinese illegals. Norman did not want these documents seeing the light of day, so he immediately cut a deal with Li. Osborn called off the Chinatown blockade and in return, Li gave him the incriminating documents. 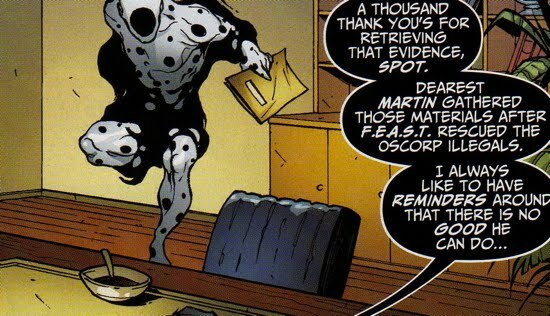 But Li then double-crossed Osborn, he used his criminal cohort The Spot, to steal back the documents and he returned them to Li. 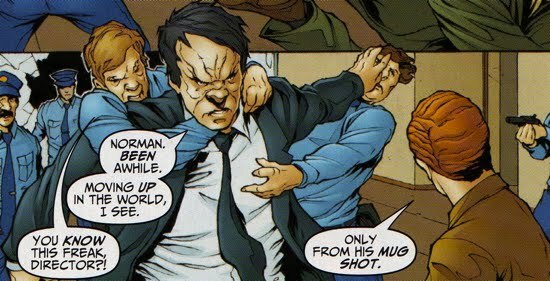 Martin Li certainly got the best of Norman Osborn and The Hood, he didn't have to pay any 'tax' to The Hood and he still has dirt on Osborn. Although, it may not matter too much seeing as how Norman has already been brought to justice, but who knows, it may be good for something one day! 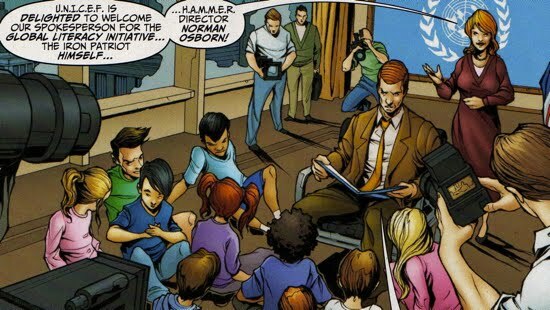 Norman reading to children, how nice! What a tremendous father figure!